Privacy and pervasive surveillance are now topics of conversation well outside of the tech community, and the idea of having your every move monitored, tracked and recorded doesn’t seem as ridiculous as it did when George Orwell laid it out more than 60 years ago. Average citizens don’t have much in the way of options when it comes to fighting the spread of surveillance technology–at least in the real world. But the new Ubisoft video game Watch_Dogs gives players the ability to bend an omniscient surveillance infrastructure that runs everything to their own whims as vigilante Aiden Pearce. The game, developed with content input from Kaspersky Lab security experts, follows Pearce as he makes his way through modern-day Chicago, trying to protect his family from pervasive danger. Pearce is an elite hacker with a violent past, and he has the skills to use the city and its Central Operating System–ctOS–as his weapons. The ctOS is the fabric that connects all of Chicago’s security systems, transportation and other infrastructure and monitors everything the citizens do. As Pearce, players have the ability to hack into ctOS, access surveillance cameras, monitor adversaries and other citizens and exploit the technology for their own purposes. 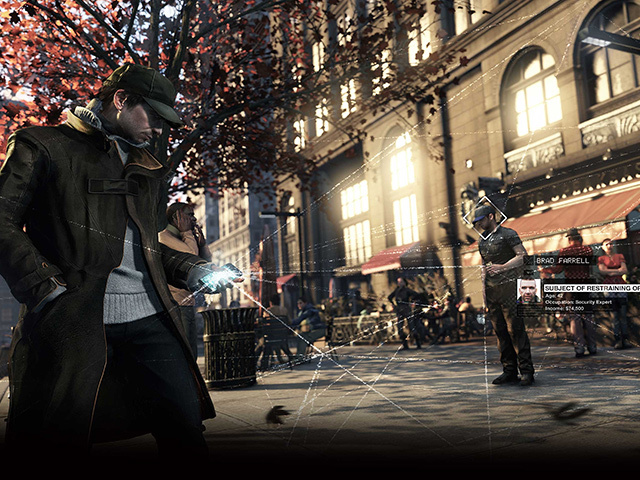 Hack your way through the smart city of the future in the upcoming Watch_Dogs game. Reality checked by Kaspersky. Hollywood has been fascinated with hacker culture for decades, as far back as WarGames; up through Sneakers, Swordfish, The Matrix and countless other movies. But real security researchers and hackers have always criticized the lack of realism in hacking scenes. Frankly, the process of hacking doesn’t look impressive, and it’s quite understandable that movie directors want to spice it up. However, there is another aspect ― whether a task can be accomplished with the help of hacking, or not. So the developers and game designers at Ubisoft wanted to make the hacking aspect of Watch_Dogs as realistic as possible. This is where the experts at Kaspersky Lab came in. The hacking content is a key part of the game, and Ubisoft sent researchers at Kaspersky a copy of the game’s script, asking for a reality check. The script ended up in the hands of Vitaly Kamluk, a principal security researcher at Kaspersky, who looked through it and liked what he saw. The game was on the right track, without the usual nonsense about unbreachable firewalls and hackers breaking crypto keys with guns pointed at them. Which is no mean feat, as it turns out. People often don’t want a bunch of reality getting in the way of their fantasy, but Watch_Dogs seamlessly weaves the use of exploits and CCTV hacking into the fabric of the game. It’s an intrinsic part of the gameplay, and Pearce’s security knowledge doesn’t feel like a superpower but rather hard-won skill. And it’s a skill that’s deployed often as Pearce moves through Chicago, controlling traffic lights, moving cameras to watch his enemies and knocking out the lights at a ballpark to ease his escape. All things that a clever hacker might have in his arsenal.